The practice of soaking nuts, seeds, and grains is easy to incorporate into any everyday routine in the kitchen. In most cases soaking nuts or seeds has a recommended time of less than 8 hours, but sprouting can require as much as days at a time. Personally I always have a batch of some nut, seed, legume or grain soaking in my house. I use them for a variety of meals and snacks. Such as salads, sauces, raw dishes and desserts, crackers, power bars, and in all of my nut milks and butters. The process of soaking nuts and grains is simple, easy, and inexpensive. 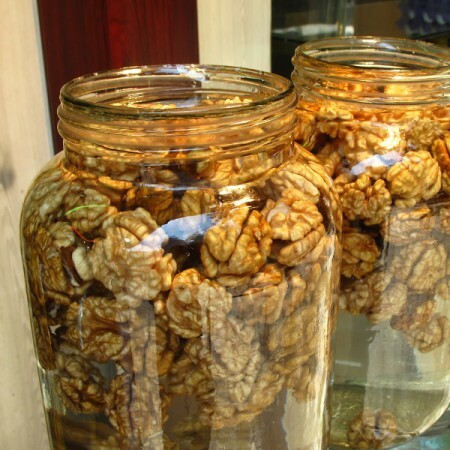 After they are thoroughly rinsed, move the nuts or seeds from the strainer to the glass container. Next, poor enough of the spring purified water into the glass container, to cover your nuts/seeds (keep in mind that nuts quickly absorb the water and you may find it necessary to add more water). For extra flavor you can add sea salt. Once the nuts are in the water, let them sit. They can simply be left on the counter or in the refrigerator to soak. When they are done soaking give them a final rinse and keep them in the fridge. They should be good for about 1-2 weeks. Another option is dehydrating soaked nuts in an oven at no more than 150 degrees, or in a dehydrator which will lengthen the storage time. If you have not had an opportunity to try soaked nuts or seeds, I highly recommend it. You may find that it is one of your favorite ways to eat nuts, seeds, and grains.